I am going to be doing a weekly post on blogs I think every role player should read. I am going to try to cover at least six links a week with a small write up about the content of the blog. For week one Here is a list of several role playing blogs that I read on an almost daily basis. 1. Gnome Stew - This blog is exclusive to gamemastering and has several great posts. If you need some good advice on how to run a game this is the place to go. 2. 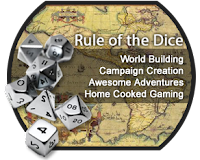 The RPG Bloggers network - This place is great, there are hundreds of awesome blogs that can be found here. I can spend (waste) an entire day just checking out all the sites available. 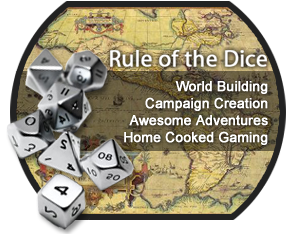 At some point I will put in an application to join the network when I have a little more material on Rule of the Dice. 3. Musings of the Chatty DM - What can I say, Chatty has a bit of everything. He is one of the most prolific bloggers in the RPG community, if your looking for something RPG related chances are he's wrote about it. 4. Jeff's Gameblog - Old school gaming goodness of all types can be found here. I particularly love this post. 5. Lamentations of the Flame Princess RPG - Yet another old school game blog. Lots of awesome insight into old school gaming can be found here, and this post on adventure writing is one of the best I've ever read. 6. Dungeon Mastering - Now that I've put up a couple of old school links I figure I should balance it with some new school stuff. Dungeon Mastering deals pretty much exclusively with the newest versions of D&D. But Yax still has some good general advice for the non D&D crowd like this post on NPC's.